I was pretty excited to read a post on Pitchfork talking about a book about musicians and their guitars titled simply – INSTRUMENT. In a sense this is like a ‘coffee table book’ (my tip of the hat to Cosmo Kramer) with photos of known musicians with their instruments. 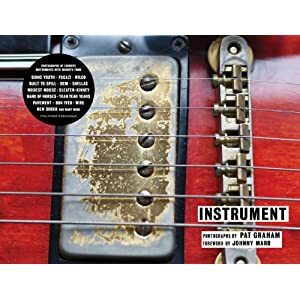 Pat Graham, the photographer for INSTRUMENT has been working on this project for over a decade, and features artists/bands like Fugazi, Built to Spill, Sonic Youth, Modest Mouse, the Flaming Lips, New Order, etc. The foreword in the book is written by Johnny Marr (Smiths/Modest Mouse/the Cribs). If you’re interested as I am in this book, it’s available from Amazon for only $19.77!